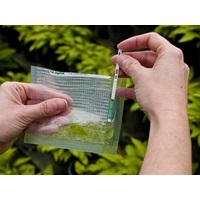 Agdia"s POTY ImmunoStrip can quickly identify more than 40 members of the Potyvirus genus and can be used to test more than 55 different crops. The test can be used in the field or in the lab and requires no experience to perform. Results are available in as little as 5 minutes with a maximum run time of 30 minutes. Potyviruses are the largest group of plant pathogens and affect hundreds of crops. Viruses within this genus are transmitted through one or more of the following means: aphid, seed, mechanical, graft and pollen. Potyviruses can have a significant impact on crop production including loss of yield, unmarketable product and regulatory impacts. The list below represents Potyviruses that are known to be detected by the POTY ImmunoStrip and does not represent all viruses that may be detected. If you have confirmed detection of a Potyvirus not on this list, please contact us. We would like to work with you to further validate the POTY ImmunoStrip's detection capabilities. *A weak reaction was observed with in-house isolates of JgMV. This pathogen may not be reliably detected with low titer samples.